The TV boom of the 1950's allowed Walt Disney to successfully enter the TV market with three hit series: Disneyland, The Mickey Mouse Club, and Zorro. The fourth TV series that Walt was considering concerned a teenage boy who would uncontrollably turn into a dog based on a book by Felix Salten, author of Bambi, called The Hound of Florence. And thus, the premise for The Shaggy Dog was born. This film was originally cast with TV in mind. Thus, many of Disney's own TV stars, including Mouseketters Annette Funicello and Roberta Shore were cast, as well as Disney's Hardy Boys' Tommy Kirk and Kevin "Moochie" Corcoran and Spin & Marty's Tim Considine. In the role of the parents, Walt cast TV star Jean Hagen and in his first of many Disney films, screen star Fred MacMurray. Surprisingly, The Shaggy Dog was the first Disney feature film made entirely in black and white. The Reluctant Dragon featured a black and white opening similar to The Wizard of Oz, but this was the first Disney film without any color. The reason wasn't because it was intended for TV, but rather that many of the special effects would look obvious in color. Director Charles Barton had a primarily TV background and he had previously directed several episodes of Zorro for Disney. Bill Walsh wrote the script, who wrote many of Disney's biggest live action films, including Mary Poppins. The film opens with a stop motion animated sequence that sets the tone for the rest of the film. Wilby Daniels lands in hot water with his dad when he accidentally shoots a missile through his house. A new family moves into the neighborhood with a sheep dog and Wilby develops a crush on their daughter, Franceska. However, an accident at a museum causes an ancient ring to fall into Wilby's pants and when he discovers the ring, he recites the Latin phrase inscribed on it and turns into the neighbors sheep dog. Wilby heads back to the museum where the professor explains that he will turn into the dog at random and the only way to stop turning into a dog is to perform an act of heroism. While on a double date at a dance, Wilby turns back into the dog and is mistaken for the neighbor's dog. While in their house, he finds out that Franceska's father is a spy. A series of comedic events leads to Wilby as a dog stealing a car and leading a police chase to catch the spies. Wilby ends up saving Franceska's life, which breaks the spell, but she of course thinks that her dog saved her. 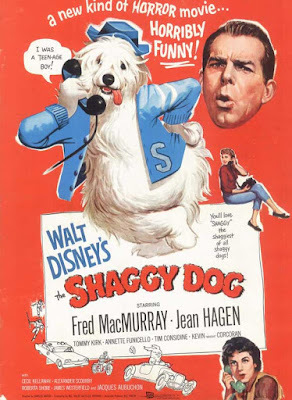 The Shaggy Dog was released on March 19th, 1959, and was a huge success. Critics found the premise unique and the humor top notch, albeit a little similar to that of a TV sitcom. But more importantly, audiences couldn't get enough of it. It cost less than $1 million to make, but it grossed $9 million, becoming the second highest grossing picture of the year behind Ben-Hur. Walt Disney's The Shaggy Dog is one of the most iconic Disney comedies of all time. It sparked a series of formulaic comedies for the studio and even though it was the first, it is still considered one of the best. It went on to inspire a sequel in the 1970's, a made for TV remake in the 1990's and a theatrical remake in the 2000's, but none of them were able to capture the lightning in a bottle. If audiences and critics had any doubts about Walt Disney's mark on live action films, they were finally removed with this film. The Shaggy Dog is currently available on DVD as a standalone release and bundled with its sequel, The Shaggy D.A. The film is presented in its original black and white widescreen version. The DVD also contains a colorized fullscreen version, a retrospective interview with the cast, a tribute to Fred MacMurray, and an audio commentary. It can also be found in a 4-movie collection where it is paired with The Shaggy D.A., the Tim Allen remake, and The Ugly Dachshund. It is also available on iTunes where it is in widescreen HD, but doesn't include any bonus features.